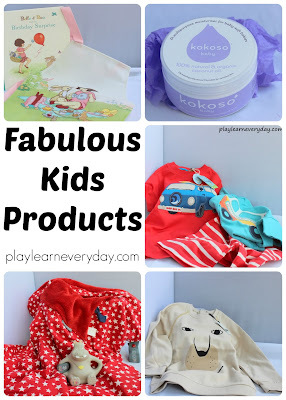 There are so many fantastic products out there for babies and kids, but there are definitely some that go above and beyond expectations. These are the clothes that are made of incredibly soft organic cotton, the skin products that are so natural that you want to cover your little ones with them and the toys and books that you just couldn't live without. We are lucky enough to be reviewing a fabulous selection of those products today. 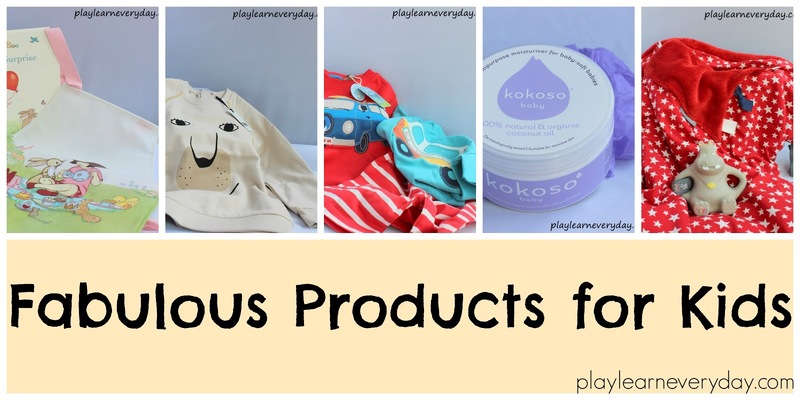 We were sent a variety of products from these fabulous brands; Frugi, Piupia, Kokoso Baby, Cheeky Chompers and Belle & Boo. Frugi are a brand that are known for making adorable organic clothes for babies and children in bright colours and patterns. Organic cotton can make a huge difference to children's skin, my two both have very sensitive skin and eczema so since they were babies I have bought them quite a bit of organic clothes. Not only is it more gentle on their skin but it also feels incredibly soft and you just want to pick them up and cuddle them all day when they're wearing it! We were sent the Wheels Applique T-Shirt with a surf van on it for Ethan, which he absolutely loves, it's a fantastic bright colour and oh so comfy! And for Ivy we were sent the Porthleven Outfit which consists of an adorable ice cream van t-shirt and super cute stripy red shorts. The quality of these t-shirts and shorts is fantastic, they are so well made and so super soft. The kids look so sweet in them, they will be perfect for our upcoming holiday! Piupia are another fantastic brand that makes organic clothing for kids. Their style is more traditional with sweet little outfits for kids and animal designs. Looking through their website there is just so much to choose from, they have a great selection of styles. We were sent a Wilderling Beauty Sweatshirt for Ivy that is a lovely neutral colour and extremely soft. It will make a great layer on cooler days and would pair well with cute little leggings that Ivy often wears. 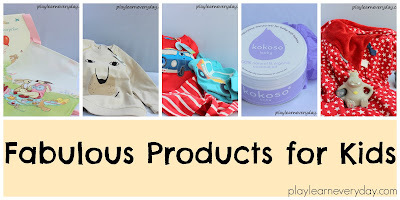 Kokoso Baby are a brand that specialises in coconut oil for babies. It is organic and all natural and fantastic for kids with dry and sensitive skin. It's also perfect for babies with cradle cap (which Ethan had quite badly) as it's even mild enough for very young babies. We were sent a large pot of Kokoso Baby Coconut Oil to try out on the kids skin. It couldn't be better timing as the kids are still recovering from chicken pox and have some remaining marks, as well as this time of year meaning that they have some dry skin. It's so lovely to use, you take a bit out and warm it up in your hands then rub in the skin. It smells absolutely incredible and straight away the skin feels softer and smoother, it's become a new part of our night time routine to have a nice coconut oil massage before bed. Cheeky Chompers are all about helping teething babies, but their products are so unique and different to any of the other teethers on the market. They've really thought about a teething babies needs and habits and found ways to make products that suit them perfectly. I wish that I had known about them when my two were a bit younger! We were sent Chewy the Hippo Teether that is a little soft hippo toy for little ones to chew on. What makes it special is that it's big and they can get a good handle on it, as well as the fact that there is a clip built in so that you can easily attach it to your pram or car seat, genius! I'm hoping that it will help Ivy when those molars start to come in. They also sent us a Cheeky Blanket, which again is unlike any other product that I've seen. It can be easily attached to the buggy or car seat, it's so warm and cosy inside and it's got the lovely little sensory tags for little ones to play with and the cutest little pouch for hands to keep warm and cosy. Ivy loves it already! Belle & Boo are a brand that is known for their adorably sweet illustrations of a little girl and her bunny that has a very vintage feel to it. They make a huge variety of products for children ranging from clothing and accessories to books and craft supplies, as well as a huge range of prints and decor for the home. We were sent a Tea Time Apron with the sweetest little image of Belle and all her little friends on it. It's made of oilcloth so it's very practical for Ivy to wear when we're cooking as well as when we're doing some messy play. They also sent us a copy of the book Belle & Boo and the Birthday Surprise. It's a sweet story about all the things that they need to do to prepare for a birthday together. The illustrations are absolutely gorgeous and the kids were both very taken by the very lovely tale. 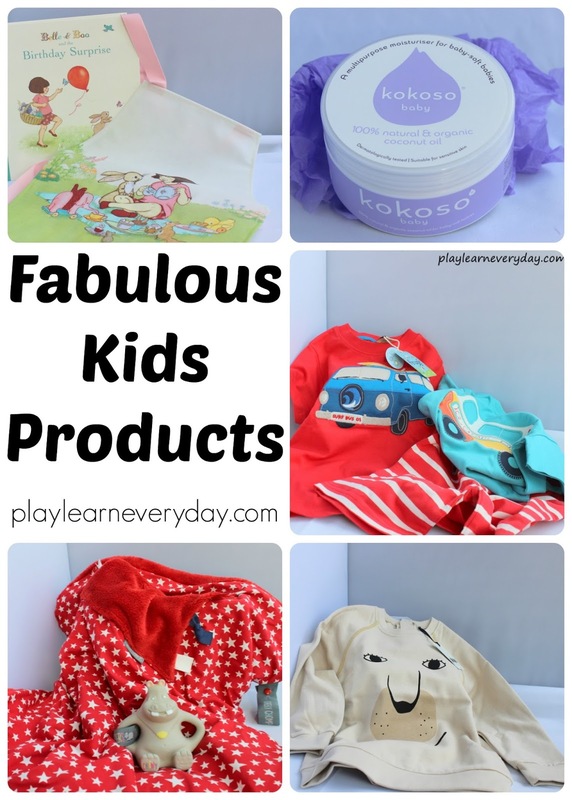 If you are looking for a truly special gift for a little one in your life, we would highly recommend that you have a look at these brands as their products really are fabulous and we are now very big fans! I love the super soft cotton T-shirts for kids. I'll have to look into them for my son. So many lovely products - i love the look and sound of Belle and Boo! I love the Frugi top - that would be so my son's sort of thing.